Bud Light River City Rockfest returns for its sixth year with a massive rock lineup Saturday, September 22 at The AT&T Center Grounds in San Antonio, Texas. South Texas’ only rock festival will feature a headlining performance from Nine Inch Nails, and will also feature Primus, Stone Temple Pilots, Bush, Chevelle, Joan Jett & The Blackhearts, Clutch, Hellyeah, Suicidal Tendencies, and many more on three stages. Specially priced early bird tickets go on sale today (Monday, April 30) at Noon CDT at www.RiverCityRockfest.com. The AT&T Center is San Antonio’s premier live entertainment venue, the home of the San Antonio Spurs and Rampage, and hosts the biggest concerts in South Texas. 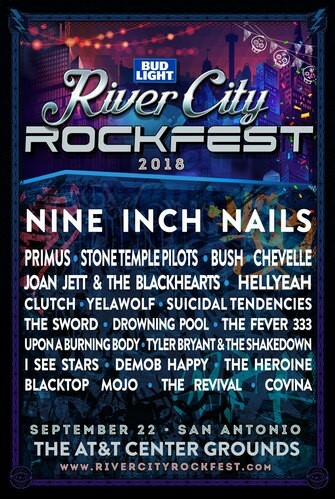 The full music lineup for the Bud Light River City Rockfest includes: Nine Inch Nails, Primus, Stone Temple Pilots, Bush, Chevelle, Joan Jett & The Blackhearts, Clutch, Hellyeah, Yelawolf, Suicidal Tendencies, The Sword, Drowning Pool, The Fever 333, Upon A Burning Body, Tyler Bryant & The Shakedown, I See Stars, Demob Happy, The Heroine, Blacktop Mojo, Lynnwood King & The Revival and Covina. Early Bird ticket prices are as follows and will increase to regular price on Monday, May 7 at Noon CDT. Fans are encouraged to buy now and save. Specially priced General Admission tickets for Bud Light River City Rockfest are available for active military through partner GovX (www.govx.com) while supplies last. Bud Light River City Rockfest is brought to you in part by Bud Light and Monster Energy.